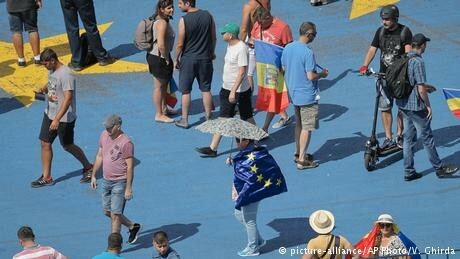 Hundreds of Romanian expatriates have driven across Europe for what is expected to be one of the biggest anti-government protests since the current administration came to power. The demonstrators, who have gathered outside the government offices in Bucharest's Victoriei Square, are calling for the country's leaders to resign over corruption allegations and early elections. Romania's ruling Social Democratic Party (PSD) has been targeting the judiciary following a string of high-profile graft investigations by the country's anti-corruption agency (DNA) and convictions of senior PSD officials. The left-wing party tried to decriminalize several corruption offenses through an emergency decree last year, however following anti-government street protests, the PSD was forced to withdraw the decree. Since their election victory in December 2016, Romanians have regularly protested moves by the PSD and its junior, liberal, partner ALDE to weaken the DNA's fight against corruption. Hundreds of thousands of Romanians have demanded a law that would ban from office people convicted of corruption. In July, police in Romania seized the number plates from a man who registered a car in Sweden with letters featuring a derogatory phrase aimed at Romania's ruling Social Democratic Party (PSD). Razyan Stefanescu's personalized plates read "MUIEPSD" which translates as F***PSD" — a slogan often used at anti-government protests. Images of his vehicle went viral on social media.